During my recent trip to the Big Island of Hawaii I had the amazing opportunity to hike with Darcy Ottey out to where the active volcano on the island, Kilauea, is currently releasing lava which is flowing into the Pacific Ocean. A 2 mile hike by starlight over basalt from earlier lava flows brought us to a primordial setting. Following an eerie orange glow we arrived at what truly could be described as the edge of the earth--a landscape made up of stars and sky, the pounding waves of the ocean and glowing lava pouring over 60 foot basalt cliffs into the sea, releasing plums of steam as it met the water. 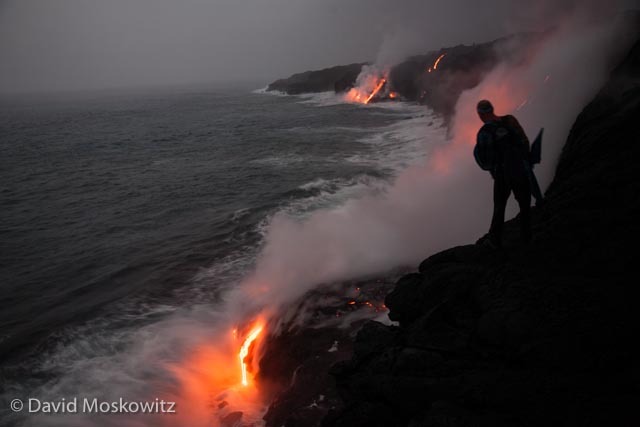 Before our eyes we watched flowing lava harden into rock and the coastline expand ever so slightly. As daylight came intermittent rain squalls, driven by a warm off shore wind brought a spectacular rainbow seemingly rising out of the glowing cliffs. It was definitely an experience I will never forget. Darcy Ottey poses with the newest rocks on the planet. We watched the still slightly glowing pile of basalt to her left ooze out of a crack in the rocks and harden. The line of smoke in the distance marks the path of lava flowing down from the rift where it comes out of the earth, seen here across a vast plane of basalt from the recent flows from this rift which has been releasing lava on and off for years. The fluid arcing shape in this basalt is characteristic of the slow moving lava, referred to as “pahoehoe” in Hawaiian, which it was formed from. As the cooling rock contracts cracks such as this one form in the newly formed basalt. A young ʻōhiʻa lehua (Metrosideros polymorpha) tree has sprouted up and flowered in a crack from a lava flow which is just a few years old. 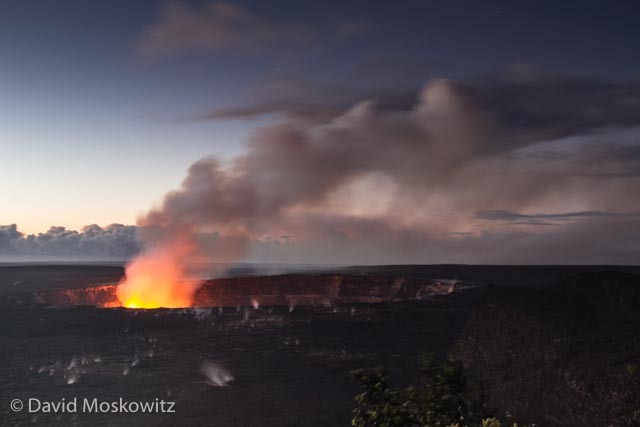 Miles to the west of Kilauea's eastern rift which is releasing the lava flowing into the ocean, the volcano's main crater is also a spectacular sight, perhaps most magnificent at night when the glow of the pool of lava within it illuminates the steam and smoke rising from the crater. Morning light illuminates the eastern sky while stars still shine higher in the sky above the glowing cauldron of Kilauea’s main crater on the big island of Hawaii. As the daylight grew stronger more of the moonscape surrounding the crater could be seen, the result of lava rising and pouring over the edges of the crater previously. The current main crater of Kilauea smokes in the distance, beyond the still steaming floor of the Kiauea Iki crater, the remnants of a volcanic event from the 1950’s in which the foreground crater filled with hundreds of feet of lava.